The friendly people of Penang are warm and welcoming of visitors to their multi-cultural island. The busy streets are lined with shops which are organized by trades and with the doors open the shopkeepers interact with the pedestrians. The key to escaping the heavy traffic on the island is riding bikes, scooters or taking a trishaw right down the middle of a congested street. 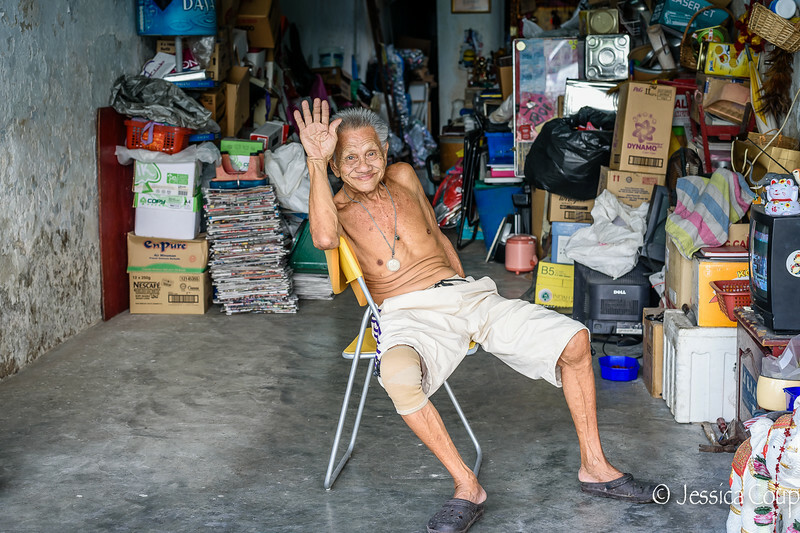 On our last day in Penang I decided to run around town once last time, and I passed this man sitting in this space watching television but turning to say hello to everyone who walked past. In occasione del nostro ultimo giorno di vacanza a Penang, ho deciso ancora una volta di andare in giro per la città. Così ho incontrato quest’uomo, seduto in questo luogo a guardare la TV, che si voltava ogni volta per salutare i passanti.